Setting a Passcodes on your Mobile Device. WhAT is a Mobile Device Passcode? 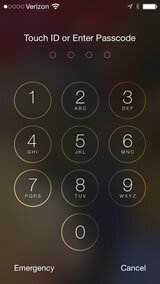 A passcode is numeric or alpha-numeric code that you enter on your mobile device (e.g. iPad, iPhone, or Andriod device) that protects your data. Each time you turn on or wake up your device, it will ask you for your passcode before you can use the device. Using a passcode is a basic security measure that can protect your data in the event your device is lost or stolen. When is a Mobile Device Passcode Required? Passcodes are required for all mobile devices that access campus data. This includes (but is not limited to) devices that connect to campus Exchange email accounts and Dropbox for Business accounts. NOTE: Even if your mobile device is a personal device and not campus-issued, you are required to use a passcode when accessing campus resources from your device. Campus managed services, such as Exchange E-Mail, require that mobile devices are configured to use a passcode and the device is encrypted to assure compliance with CSU policy and audit. Mobile device setup to access the campus Email system and/or DropBox must be configure to support the use of passcodes.